It’s a nice piece and adds a cool touch to an already fine product. As if the potent elixir in their tequila bottles needed any extra enhancement, 1800 has released a limited edition collection of art bottles featuring an eclectic group of emerging artists from around the globe. The art featured on the bottles has also been showcased as outdoor billboards and is due to appear on limited edition footwear. 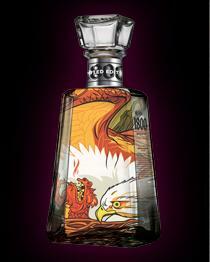 Each bottle has a run of only 1800 units and is individually numbered, adding a touch of exclusivity to the project. While the initial collection features art from nine different artists, my specific bottle is designed by Josh Ellingson out of San Francisco . It’s kind of hard to tell in the picture, but the artwork appears only on the back side of the clear bottle, leaving the rest of its pristine clear design untouched. It’s a nice piece and adds a cool touch to an already fine product. To clarify, the tequila inside these bottles is their 80-proof Silver only, not their 100-proof Select Silver or any of their other varieties. My only prior experience with the 1800 line was the Select Silver, and I found the difference between that and the regular Silver to be quite noticeable. Paradoxically, the regular Silver seems a bit harsher to drink than the powerful Select. It doesn’t burn as much going down due to the lower proof, but it has a much more noticeable and lingering taste. Regardless, after a few shots the taste will magically smooth out, leaving pure tequila pleasure. You may also find the artwork come to life before your eyes depending on how much of the bottle’s contents you tackle, and the art makes it very easy to locate the bottle in any condition. Bonus! The 1800 company has also opened the door to other aspiring artists via a contest on their website to design your own bottle. Top submissions through 12/14/08 have the chance to win a $10,000 grand prize, so if you have any design sense you may want to pay a visit to the website at their website. The company’s goal is to share 1800 essential artworks with the world via additional bottles, billboards, and shoes, as well as a nationwide ad campaign, so even if you don’t land the top prize you may gain some exposure for your artistic endeavors. The infusion of cherry makes for excellent mixed drinks.